It's well known that Mitt Romney is a shameless flip-flopper ready to shed any and all traces of his former moderation to win the GOP nomination. But this week we’ve seen an instance where Romney has been falsely accused of flip-flopping, yet Romney, hilariously, hasn’t protested, presumably because he has no particular interest in correcting the record. The subject is the minimum wage. When he was Massachusetts governor, Romney vetoed an increase in the state minimum wage from $6.75 to $7.50 in 2007 and to $8 in 2008 on the grounds that it exceeded the inflation rate. He urged the state legislature to raise it to $7 and henceforth to adjust it every two years according to inflation. 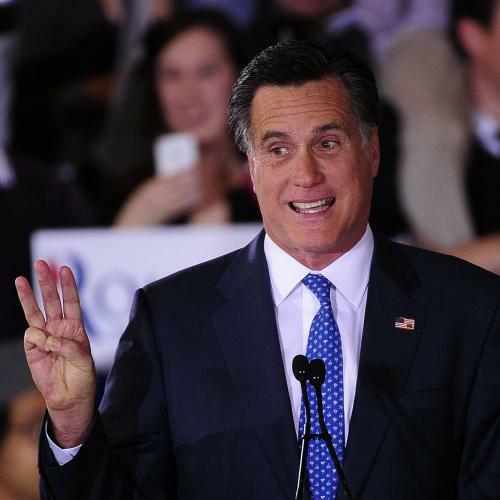 The veto was overridden, mooting Romney’s stance, but Romney continued to support the idea of indexing the minimum wage to inflation, which he'd first promoted in his 2002 gubernatorial campaign. This position puts him well to the left of most Republicans (many of whom would like to abolish the minimum wage altogether) and even a lot of Democrats. “I haven’t changed my thoughts on that,” Romney said as recently as February 1. Actually, what happened was much more interesting than that. Romney, pressured by a conservative ideologue to change his unacceptably liberal position on the minimum wage, squirmed and fudged a little, but he didn’t flip-flop. Now that’s a story. Tear up the front page! Kudlow: A lot of conservatives, led by the Wall Street Journal editorial page, were horrified when you said you want to index the minimum wage for inflation. And they said, “Look, that’s just going to raise the minimum wage. That’s going to raise the unemployment rate, especially for young people, especially for minorities. It’s sort of a little bit of unfinished business.” Why do you want to raise the minimum wage? Why do you want to index it for inflation? Romney: Well, actually, when I was governor the legislature passed a law raising the minimum wage. I vetoed it. Romney: And I said, “Look, the way to deal with the minimum wage is this. On a regular basis,” I said in the proposal I made, “every two years we should look at the minimum wage, we should look at what’s happened to inflation. We should also look at the jobs level throughout the country, unemployment rate, competitive rates in other states or, in this case, other nations.” So, certainly, the level of inflation is something you should look at and you should identify what’s the right way to keep America competitive. Kudlow: ...or at least very minimal inflation so far. Romney: Yeah, so that would tell you that right now there's probably not a need to raise the minimum wage. What I can tell you is had one indexed the minimum wage back to, let’s say, 1990, the minimum wage would be lower now than it actually is. Democrats make big hay of this every few years—“Oh, we’re going to raise the minimum wage”—and get a lot of hoopla for it. Frankly, the right way to process it is to look at the minimum wage, look at how unemployment rates are, make adjustments as time goes on based upon our need to compete, the need of the job market, and, of course, what’s happened to inflation. Romney wasn’t changing his position on the minimum wage; he was reaffirming it. But he was also saying that, since inflation is pretty low, he didn’t see any need for the minimum wage to go up right now. The minimum wage was last raised (to $7.25) in 2009. Since then, the annual rate of inflation has been, on average, 2 percent. If you want to be a stickler then yes, Romney should now be willing to say, “Let’s raise the minimum wage by 41 cents.” Romney’s fudge factor about unemployment rates and “our need to compete” sounds like a new wrinkle added for this very reason. But basically Romney was re-stating his previous position. When inflation goes up, the minimum wage should go up. That stance, even when you add loopholes, is fundamentally unacceptable to conservatives. Yet Romney is sticking to it (at least for now). He’s probably just as happy that everybody thinks he isn’t.